It's no secret that Destiny is going to get bigger in the months and years to come; Bungie has already announced two expansion packs for the game. Now, thanks to an odd-looking bug, we've gotten what appears to be a look at what those expansion packs will add. This video, posted to YouTube by Scott M, shows a weird bug that locked the player out of all missions (including Tower) while simultaneously revealing every mission on the map. 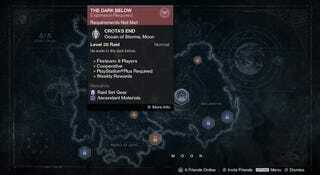 It shows a number of new strikes and two new raids, all housed on planets that came with the base game. One of the raids takes place on Reef, where the Awakened queen and her jerkface brother live. The names of the expansions in the video match up with the names of the planned DLC expansions: The Dark Below, which will be out sometime in December, and House of Wolves, which is coming sometime next year. It also shows the Iron Banner, a free multiplayer event coming in October. Bear in mind that while this bug does appear to reveal a number of new additions that line up with what we're expecting from the expansions, there could well be other additions like new gear, bounties, crucible maps, etc. It's also not clear whether the expansion content is already on the game disc—it's possible (or even likely) that the icons on the map are just placeholders for new content that will be delivered digitally. We've hit up Bungie to see if they'd be willing to give us a better sense of what the DLC will bring, and will update if we hear back.